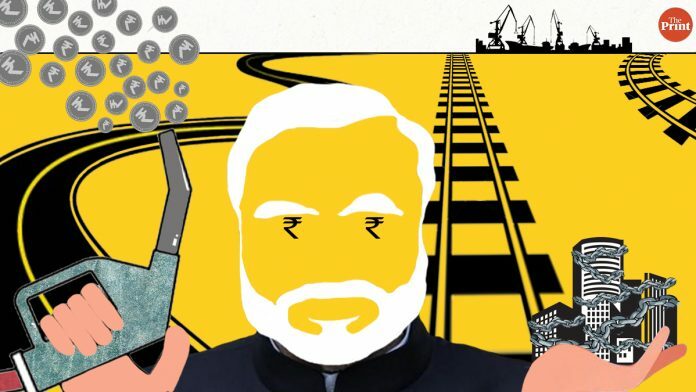 Depending entirely on where your voting preference lies, the Narendra Modi government has either performed brilliantly or disastrously on the economy in its five years. Its fans say, look at the data. Critics counter, indeed, look at the data, but how do we judge when you merrily fudge? We shall let the experts on both sides wrestle over it, and merely take a broader view of five years of the political economy. As the Modi government’s five-year term ends, let us list the five things it has got right. I repeat, for emphasis, that I look at this picture from the lens of politics, or political economy, not pure economics. Hence, in my book, the biggest positive is implementation of the IBC, or Insolvency and Bankruptcy Code process. It is true that only 12 defaulters have been put under bankruptcy proceedings yet. But these are the 12 biggest and the most powerful. What follows is that these are the types with the most number of powerful politicians and civil servants on speed-dial, with many accumulated IOUs. The fact that none of them has been able to secure a “phone-banking” reprieve, not even the mighty Ruias of Essar, shows a new political intent. See it this way. Once you know there is no possibility of getting a reprieve or evergreening through a “friendly” phone call, you learn to deal with a new era in Indian capitalism. Where bankruptcy is an inevitability if your business fails. For its capitalism to come of age, a society has to learn to accept the bitter fact of failure. In India, bankruptcy has been seen as a family embarrassment to be hidden. An avowedly Left-socialist, but “phone-banking” state was complicit in this. The Modi government ended that. The big boys are going bust. It is out of this bonfire of corporate vanities that a new Indian capitalism can emerge. I see this as essentially a welcome political and cultural change, never mind the amounts of bad loans it actually brings back to the banks. If no one (in the private sector) is too big to fail, the lesser players will fall in line. What did the Modi government do with all this additional money it collected from fuel taxes? The answers lies in the next thing we think it got right — cutting fiscal deficit. Piyush Goyal is right when he says the NDA inherited from UPA-2 a fiscal deficit of about 4.5 per cent of GDP and rising. If it is at 3.4 today, despite all the tens of thousands of crores the Modi government has paid out in voter giveaways, it is in a large part because of this oil bonanza. Oil subsidies had emptied the fisc under UPA-2. Helping this along is the fourth of the five successes in our list: Improvement in tax compliances and tax-to-GDP ratio, from about 9 to 12 per cent of a much larger GDP. At higher levels, the taxman has been rough, drawing charges of tax-terrorism. But at lower- and middle-class levels, the reforms in tax administration have been effective, greatly reducing human interface. If you aren’t a sizeable business or specifically targeted by the “agencies” or politically victimised, your experience with the taxman is cleaner. The fifth and last, indeed, is GST. It had its hiccups and discontents in the BJP’s core constituency of traders. But it stayed the course. Of course, there are many areas of failure, from agriculture to exports, and from jobs to unreformed PSUs and, finally, the globally embarrassing data fudges. There was also demonetisation, which rivalled in its nuttiness Mao’s war on the sparrows. We’ve been complaining about these things and more, and will continue to do so. This week, we acknowledge the rarer instances of a government showing that good economics isn’t necessarily bad politics, or vice versa. A good National leader has key attributes, should be honest (no phoning system), committed (larger national interest), have feel of people’s pulse (that is sometimes called political economy) and conviction in the action. Coming from the pen of ace critic sensed journalist like Mr. Shekhar Gupta, who I read with interest, the article provides a balanced review of the the NDA government, touching upon the above mentioned attributes. The economic friends of Mr. Gupta will also agree that like “Lakshmi”, economy is also unsteady and condition of equilibrium is is unstable, particularly when the Government has desire to change. The socialists try to have the comfort of equilibrium in no change situation and people and the state face heavy cost in long term. For a country to keep pace with social and economic development, the adjustments to dynamics of equilibrium should be part of National culture. It’s a little dythirambic. But let’s move on to this aspect. The disappointment after reading this article is that S. GUPTA is neglecting one aspect. What has been done in recent years has also been possible because the way has been prepared since 1947 by the predecessors of the present government team. The past is important to understand the present and to prepare for the future. I wonder one thing. He is talking bout t 5 years economy under nda but cautiously ignored demonitization…not a single word. do i smell a bhakt here? Mr Gupta, you have missed the vital point while writing about “political economy”. What about crude oil prices? These were historically low during the rule of Mr Modi. No PM was as lucky as Mr Modi is. Very high or high oil prices never gave any legroom to the previous PMs. Surprise,surprise, well analysed ,unbiased article on Na Mo. A surprise change Mr Shekar Gupta ji. Is it the same Sekhar Gupta, who wrote this ? Excellent article with well balanced views. Out of the five successes enumerated in the article, the fourth one is of critical importance. Whereas demonetisation has been a costly mistake in the short run, the fact that it has some long term benefits is largely ignored. Improvement in Tax to GDP ratio is one of these benefits. In sum, how to evaluate Modi’s five year term? As usual, there are some hits and some misses. However, the evaluation will not be of Modi alone. All others, including Rahul Gandhi, will be subjected to critical evaluation. The end result is imponderable, as is the stock market movement. Modi has committed many errors; but certainly, Rafale is not one of them. My hunch is that the BJP will be somehow able to cobble up majority with help of known and unknown allies. But most probably, Modi will not lead the alliance. If you praise NaMo , RaGa will kick you out ! Inflation targeting has been the pet obsession of the government since 2007. The devil is in the details – as to how it has been achieved. The inflation-targeting consensus has meant that Indian businesses raise money at some of the highest rates in the world. That makes our business financing anemic and uncompetitive. A large part of the failure to create jobs is due to this. Insofar as reducing fiscal deficit is concerned, to the extent that it has been achieved through increased revenue is commendable. On the other hand, that component which has been achieved by cutting back on education and healthcare funding will come back to haunt us in the future. Shekhar ji join BJP. You are better at defending modi than any bhakt….modi will give u place in cabinet for sure. Any comments regarding the article? “As the Modi government’s five-year term ends, let us list the five things it has got right. I repeat, for emphasis, that I look at this picture from the lens of politics, or political economy, not pure economics.” Mr.Gupta, why are you so defensive about saying something positive about Modi government? Very good article Mr Verma after a very long time . Its balanced and it shows that you have been on the ground . Every government & leader are judged on their actions . True a lot is to be dome but the intent is there and it shows vs what we have seen in past governments. The fact is UPA-2 budget was not Manmohan’s , but Sonia Gandhi’s! MMS was nothing but “the behind the scenes” Her Majesty’s Voice! Very well articulated article. It’s unbiased. It is important to appreciate good deeds of the government and criticise the bad one while reporting for ones own reputation sake. Most in the journalism business are either in one camp or the other and end up loosing the respect for being a professional journalist.